NETWORK FINALS: 60 MINUTES gained 0.1 in final numbers, but the 9PM episode of THE CARMICHAEL SHOW, HOLLYWOOD GAME NIGHT and the SCORPION rerun lost the same. That left CARMICHAEL SHOW at 50% of its LITTLE BIG SHOTS lead-in. CABLE HIGHLIGHTS: One guess what topped Sunday cable, although AMC’s THE WALKING DEAD did dip 0.19 to 5.96. TALKING DEAD was up 0.02 to 2.34, and COMIC BOOK MEN was down 0.02 to 0.37. On Bravo, REAL HOUSEWIVES OF ATLANTA fell 0.13 to 1.12, and REAL HOUSEWIVES OF THE POTOMAC edged down 0.02 to 0.69. Discovery’s NAKED & AFRAID returned at 0.84. Showtime continued to enjoy the weak competition at HBO, with SHAMELESS up 0.06 to 0.68, and BILLIONS up 0.01 to 0.37; THE CIRCUS still languished, but even it was up 0.01 to 0.06. As for HBO, VINYL held at 0.21, GIRLS lost 0.02 to 0.22, TOGETHERNESS ticked down to 0.10, and LAST WEEK TONIGHT remained the night’s champion, up 0.05 to an impressive 0.38. The latest installment of ESPN’s periodic 30 FOR 30 documentary series was at 0.66, ahead of its NCAA bracket commentary special at 0.64. Adult Swim’s ROBOT CHICKEN was at 0.60, and VENTURE BROTHERS was down 0.02 to 0.48. Univision narrowly missed the Top 10 with a LIGA soccer match at 0.56. The latest DEMOCRATIC TOWN HALL aired on CNN at 0.53. Spike’s BAR RESCUE gained 0.05 to 0.49. 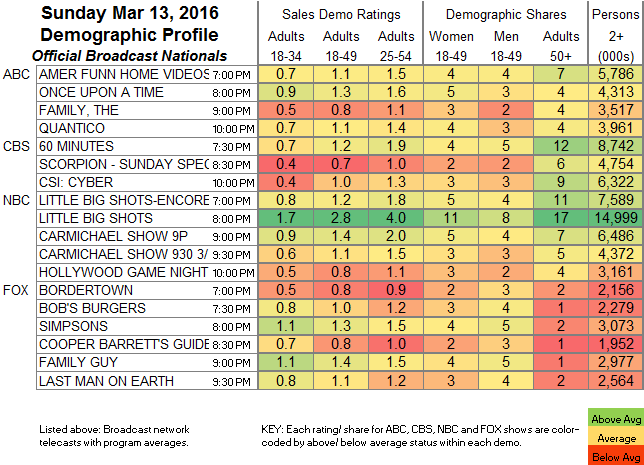 TLC’s LONG LOST FAMILY jumped 0.13 to 0.42, better than its lead-in LONG ISLAND MEDIUM, which was up 0.08 to 0.36. On Food Network, ALL-STAR ACADEMY held at 0.41, GUY’S GROCERY GAMES was up a tick to 0.37, and CUTTHROAT KITCHEN was steady at 0.37. A&E’s INTERVENTION was at 0.36, while HOARDERS was down a hundredth to 0.30. On Tru, IMPRACTICAL JOKERS gained 0.03 to 0.36. 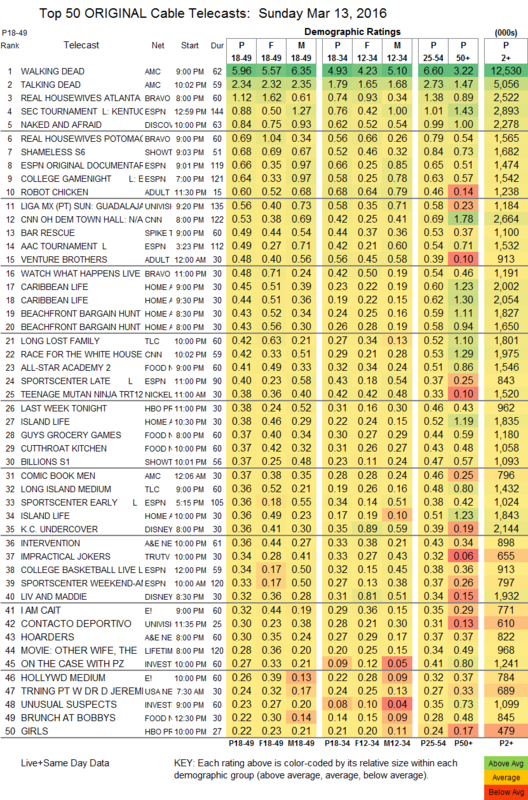 On E!, I AM CAIT remained at 0.32, and HOLLYWOOD MEDIUM was down 0.02 to 0.26. Hallmark’s WHEN CALLS THE HEART gained a tick to 0.21. The first part of Lifetime’s 4-hour AND THEN THERE WERE NONE was at 0.18.